The Conversations are an opportunity to connect on a deeper level with a variety of distinguished professionals, culture changers, and peers within the community. 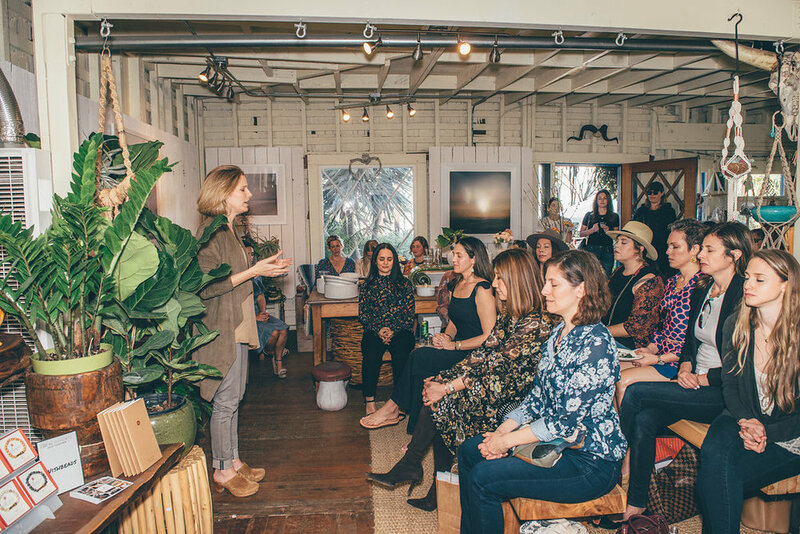 These intimate gatherings offer insights into timely and inspiring topics in a fun and unique setting. As with all Local Mercato events there is always a thoughtfully curated selection of vendors to shop and food to discover. These events are reservation only, you can get on the wait list for our next event. Ingredients for Intimacy - one of our latest talks went into the how-to on emotional intimacy with 5 key takeaways. JUNE 2018: "INSPIRING INGREDIENTS TO ENHANCE INTIMACY"
Dr. Christina Stein is a relationship expert and international speaker who specializes in empowering individuals and couples to lead passionate, authentic lives. their relationships. It is her mission to teach them how. Through one-on-one counseling, best-selling books, and speaking engagements, Dr. Stein educates men and women in strategies for overcoming emotional blocks that compete with achieving personal growth and loving passionate relationships. FEBRUARY 2018: "HOW TO DE-STRESS - THE CANNABIS TALK"
Sally Goluboff received a Master’s Degree in Traditional Chinese Medicine from Yo San University. She completed a residency program at Children’s Hospital Los Angeles. Sally also completed an externship program at Venice Family Clinic, which is a medical clinic in Los Angeles that serves low-income residents. Sally enjoys working in an integrative setting and treating patients of all ages. She is also passionate about treating women’s health and fertility. Dr. Sherry Yafai graduated from UCSD medical school in 2005 and continued on to complete her training in Emergency Medicine in 2009. She began practicing ER Medicine at St. John's Hospital in Santa Monica where she continues to work today. It was over this decade of work and training that she found her interest in medical cannabis work. She established the Releaf Institute in 2017. Dr. Yafai's goal is to educate both physicians and patient's on the benefits and harms of cannabis use, as well as to decrease the mortality in this global opioid epidemic by using cannabis for pain management. She is currently working with the UCLA cannabis initiative on a alternative solution to narcotics use for pain management.